Cambodia, April 1975. Chou is a young woman whose everyday world is suddenly upended by the arrival of the Khmer Rouge regime. 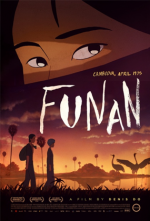 During the chaos of the forced exile from their home, Chou and her husband are separated from their 4-year-old son, who ha... show all s been sent to an unknown location. As she navigates her new reality, working in the fields day and night under the careful watch of soldiers, and surviving the small indignities and harrowing realities of the increasingly grim work camps, Chou remains steadfast in her determination to reunite her family - even if it means risking everything. Follows Chou, a young woman living in the chaos of 1975 Cambodia, amid the arrival of the brutal Khmer Rouge regime. When she and her husband are separated from their 4-year-old son during a forced exile from their home, Chou remains determined to re... show all unite her family - even if it means risking everything.